Teaching the EMC Essentials seminar in Colorado. Attention East Coast EEs: I’d like to announce our next EMC Essentials course will be held in Gaithersburg, MD, this coming May 15-16th. These courses provide participants with the tools for recognizing EMC issues with any proposed high-speed design. What makes our seminars special is that the teaching is at a very practical level with just enough theory for understanding. Several demos of the basic principles will be included. 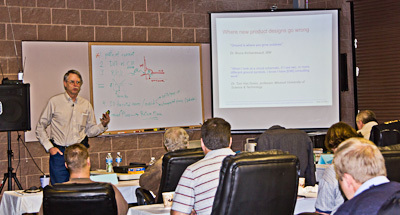 In addition, participants will learn several unique and low-cost ways to test and troubleshoot prototypes well before product qualification testing. By understanding the basic EMC design principles and performing early testing, designers will have a much higher probability of compliance at the prototype stage.